Join the Orchid Society If you reside in the greater St. Louis area and have a passion for orchids, why not join others who share your affinity! Click here for more information. Award Winners Click here to view some award winning orchids submitted by our members. 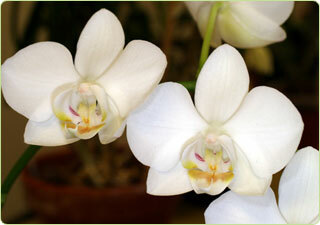 Welcome to the Orchid Society of Greater St. Louis. Meetings are held the second Friday of each month (except July and August) at 7:00 pm at the Missouri Botanical Garden in St. Louis. Visitors are always welcome. Please explore the website to find out more information on our society, and feel free to contact us if you have any questions. The Society cooperates with the American Orchid Society in regional judging which is held on the first Saturday of every month. PLEASE NOTE: Dr. Peter Wyse Jackson's talk on "Orchids and the Garden" will now be held at the May 10, 2019 monthly meeting. The January 11, 2019 meeting was cancelled because of the winter storm. The Orchid Society of Greater St. Louis is a 501(c)(3) non profit organization.